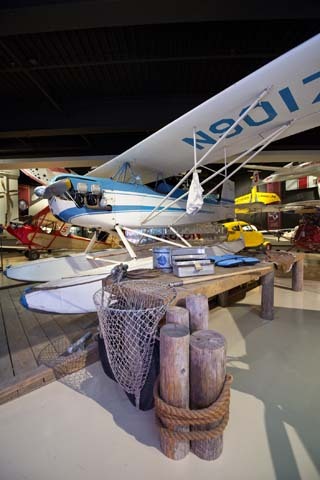 The EAA Aviation Museum’s Baby Ace was built in the early 1960s by Stafford “Casey” Lambert at his summer home on Lake Minocqua in northern Wisconsin. EAA founder Paul Poberezny, a longtime friend of Casey, assisted with the project and logged a lot of hours on the airplane. Lambert made enough changes to the original Baby Ace design that a new model designation was justified — Model D. The fuselage at the cockpit was widened to increase comfort for the pilot. Where necessary, the fuselage was strengthened to accommodate floats and an 85-hp Continental engine. The ailerons were extended by one foot inboard and the fin and rudder were enlarged. These changes differentiate the airplane from the earlier Model C Baby Ace. 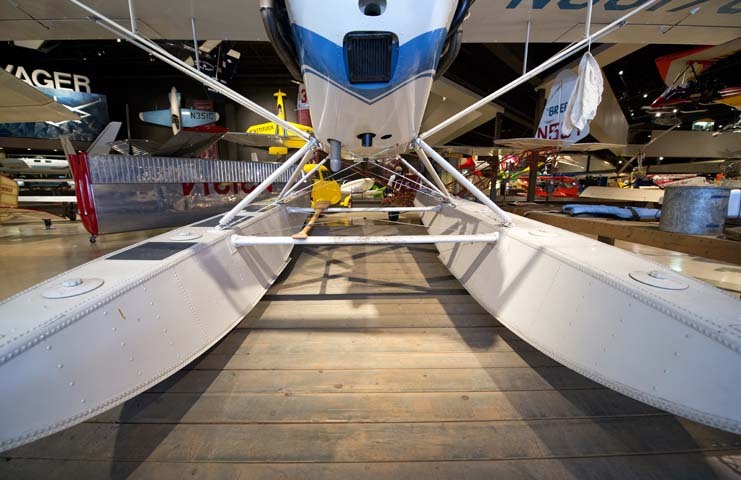 Initially, the airplane was mounted on floats that were manufactured in 1938, one of the only items that was not new when the Baby Ace was assembled. The 1938 floats were in near perfect condition and had no leaks despite their many years of service. However, they were later replaced with a set of new Edo 54-1140 floats, which are known for their lightweight and strong construction. The name Box Full, the title Lambert gave this creation, represents the 25th airplane he owned. As an ardent hunter and sportsman, Lambert explained the name: as 25 shotgun shells make a box full, so the Baby Ace fills his box of airplanes. The Continental engine was later replaced with an oversized Lycoming O-290-D2, rated at 135 hp. The result was a floatplane that performed with the very best. Paul reported that the Baby Ace would take off from the water in 350 feet and register 2,500 feet per minute rate of climb. In addition, it would loop from level flight with Paul making as many as six consecutive loops without loss of altitude. 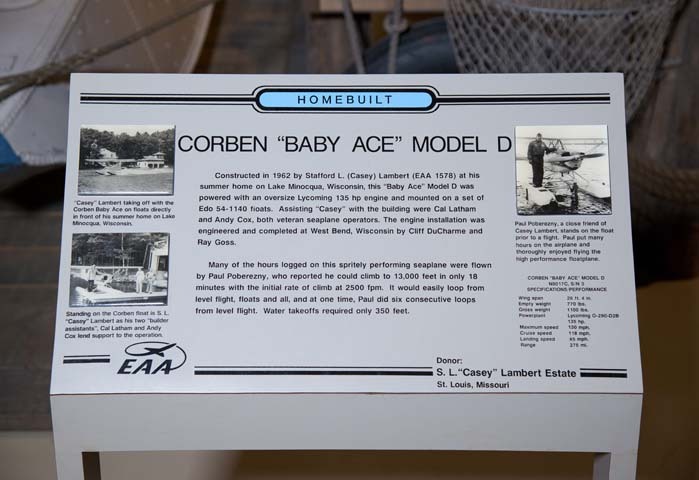 When Lambert died, his estate donated the Baby Ace on floats to EAA. 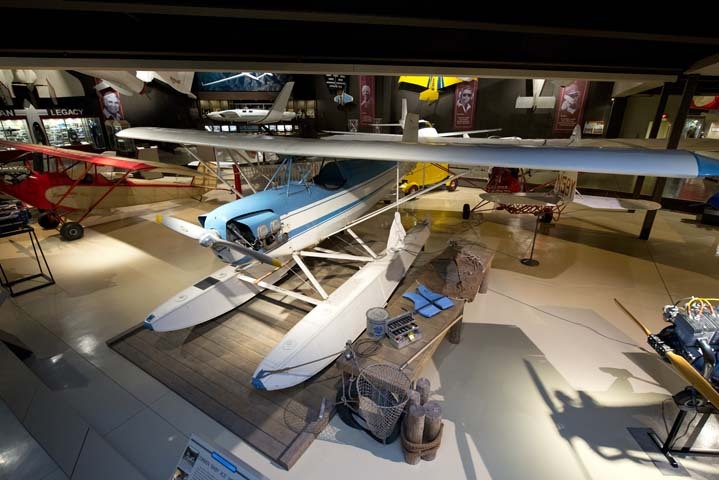 The Box Full Baby Ace has been on display in the EAA Aviation Museum ever since.